Gator sighting. The guy across the lake reported seeing a 3’ gator a few days ago. He’s new so I wasn’t sure whether we really had a gator or just a couple of turtles swimming close together. He reported that his grandkids were fishing off his dock and the gator went after their bait. Still………. Last night I went down to the dock to go fishing and both George and Harvey were down there casting frog lures for the gator. They said Harvey had hooked it but it broke through Georges fishnet. So no doubt, there’s really a small one swimming around. Probably not for too long. The other wildlife sighting was a turkey family – a mom and 8 youngsters. They walked around, pecking the ground, for about 10 minutes before walking off into the jungle. I’ve seen them a couple of times but this sighting was fun because it lasted so long and we were so close. We’re in full summer mode now – low 90’s with regular, torrential afternoon thunderstorms. I think this week we picked up 6”-8” so the lake is risin’ and the fish are bitin’. We had a fairly dry June and the lake had dropped a couple of feet from the high in April. We’re still not back to that level but if this pattern holds, we’ll be there going into August. There’s usually a fairly strong wind component to these afternoon storms and the roof and gutters have loaded up with pine needles – enough to bother my bride. So I got out the ladder and went around the perimeter cleaning it off. I noticed a phenomena on the roof that has me puzzled. We have a metal roof held on by screws. These are stainless screws 2” long and I noticed that along one side of the house a screw was backed out about half way. Then I spotted another and another. Luckily they were on the edge row and the next row up but nothing higher than that. By the time I had finished that side of the house I had tightened 15-20. There are probably a thousand fasteners holding it down so it wasn’t in any danger of blowing off but I can’t imagine why they would back out – not stripped but backed out. I’m wondering if it happens again should I replace those screws with larger ones? It would be easy enough to do but I really hate to mess around with anything as basic as a roof. For those who track such trivia – the tomato seeds I planted 4 days ago germinated overnight. That’s a day or so faster than I anticipated. I have 3 varieties each planted in a separate starter cup so I can keep track of them. I moved the variety that popped outside onto the screen porch. That should give them natural light but not direct sunlight. I usually move them under a grow light and keep them indoors so this is a different approach. I might alternate between inside and out to keep them from the really hot afternoons. Not sure yet. I expect the other tomato varieties to germinate inside the next 48 hours. The peppers and eggplant seeds should take another week. My game plan is to really baby these seedlings into healthy transplants. The viburnum bushes we had cut back so severely are leafing out beautifully. Those bushes had lost all their leaves last winter to some kind of fungus so it wasn’t clear to me whether they were alive at all. Simon and I took the chain saw to them and figured it was 50/50 whether they would survive either the fungus or the pruning. The leaves coming in are bright green and super healthy looking and attracting loads of juvenile cardinals and wrens. Those bushes/trees were planted originally as a privacy hedge outside the large bathroom windows so with them gone, it’s wide open. That could bother some people but we now get a bird show or sometimes a squirrel show from the bathtub. I’m guessing that by mid October there will be plenty of privacy cover. Olivia did a micro vacation at the lake and it turned out to be non-stop action. She made a quilt, learned to make spaghetti sauce and cleaned the decorative foliage that sits atop all our kitchen cabinets. The plastic foliage and other items mixed in collect dust and are too high for Nancy to deal with so an annual full cleaning is necessary (to Nancy). It was lots of fun having her and I don’t think, with so much going on in the house, she ever made it down to the lake. The other big news also comes from Tom’s family. I mentioned that Simon stopped by the other day on his way to a job interview in Alabama. He got the job. He will be employed by Auburn University in conjunction with the 4H organization to do outreach environmental education for all the schools in a particular county. His county/territory is a rural area southwest of Birmingham. He still has outstanding applications but this offer is firm and one he wants so it’s likely, but not 100% done. One thing that struck us as funny is that one of the jobs he inherits is head coach for a championship level kids shotgun team. To the best of my knowledge he’s never shot a shotgun and was raised in an anti-gun household. We used to keep it a secret from his mother when he’d shoot my pellet gun or a 22 caliber rifle for a boy scout merit badge. Starting the fall garden. The fall garden is the trickiest because it straddles hot weather crops and cold weather crops and much depends on the exact way the weather breaks. In that sense, it’s mostly out of my control. I’m going to add to the uncertainty by trying varieties I’ve had issues with in the past. I’ve attributed most of my failures in the past to soil quality but I’m now convinced that’s not an issue and ready to test it. So it’s San Marzano tomatoes, crook neck squash, acorn and butternut squash and Italian grilling peppers. I may be going with a new cucumber variety as well but that’s not voluntary – I just can’t find any Sweet Success seeds. I started seeds, indoors, for the tomatoes and peppers earlier this week. In a perfect world, those will result in plants going into the garden by Labor Day. The squash and cucumber seeds, along with pole beans, will go directly into the garden at the same time. And I’ll start seeds, indoors, for cabbage, kale, collards and broccoli then – destined for the garden Oct 15- and maybe some heat resistant lettuce. All of this assumes no hurricanes. I’m also going to try a variety of carrots, in September, that supposedly handles heat. Is it a bad sign if one of your fingers turns black? Only on the top side? I must have banged it against something but no pain or anything to alert me that something wasn’t exactly right. So I was surprised when I looked down and saw a black finger. It lasted about 3 days then cleared up just fine. Plavix. Had fun house guests this week – Simon and his lady friend, Amy. I use the term house guests but they spent hours and hours floating in the lake. They’re coming back later this week on the way back to Alabama – Amy back to work, Simon for a job interview. And who could blame them for the big float trips – it is truly hot, hot, hot. Arizona kind of hot. The garden is in full “bake” mode. There are only two garden rows (out of a dozen) with anything growing – a few green peppers, a few jalapeños and a few eggplants. All the other rows are barren and just soaking up the sun. I keep these rows cleaned of weeds so they really do heat up. That’s part of my anti nematode prescription which, overall, seems to be working better each season. Your never exactly sure which part of the attack is working but the combination is for sure. And we are starting to get more summer rain. We got 4-5” last week and the forecast is for more of the same on a daily basis so the lake level is creeping up and cooling down. Perfect. I noticed one other “crop” that is dealing well with the heat and humidity – the bamboo crop. Holy cow is that stuff growing. I use it occasionally for stakes but it puts out far more shoots/trunks/branches than I can keep up with. We need a panda. A typical shoot that I cut is about 2” in diameter at the base and 20’ long. They seem to last about 2 years before totally drying out and breaking. Nancy alerted me to the fact that the oven wasn’t heating properly. To me that means heavier use of the Holland; to Nancy that means call the repair guy. We compromised and ordered a new heating element online for me to play appliance repair guy. It looks like a very simple fix. Maybe it will be something else but the element is so cheap, why not give it a try. No doubt the top element was getting hot and the bottom one wasn’t. For insurance, I went out and caught a couple of bass that are best fried. I think maybe the rain mentioned above is getting the fish moving around a bit and heading back to the shoreline to feed. Just what you figured: the part didn’t quite match the original equipment. It took two days and significant effort by George to modify the new part to do the job. I put about 6 hours into it and George another 3. Nothing is ever easy. We had a great lake party Sunday, celebrating Olivia’s 19th birthday. Ate early, an Italian feast, then spent the next few hours in the lake or lounging on the dock. 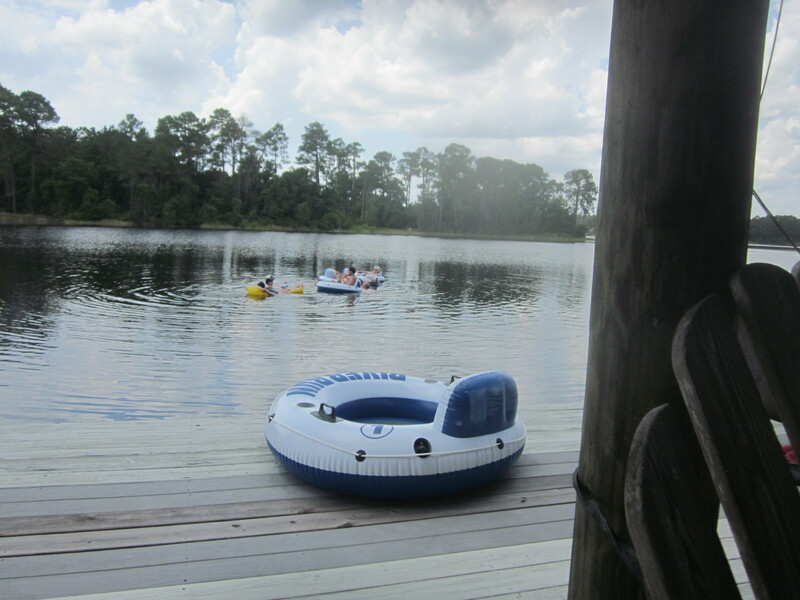 Tom brought his tubes up which were a great addition to the water activity. Good thing we had it Sunday since it really stormed big time on Monday. The pic is not very good but it will give you an idea of the lake activity. I was the only one not in the water. Somebody had to watch the cooler, didn’t they? After staying on the dock through a few of these afternoon storms recently, I decided to forego the experience and get back up to the house. Good move. We got 2.5” in about 30 minutes and loads of howling wind and lightning. Then it calmed down and dropped another inch. The lake needs the water and the cooling down so I was ok with the whole event. I was watching the progress of the storm on the radar and saw a large hail cell not more than 3 miles from here. I got up the next morning secure in the knowledge that I had fairly well cleared out the jungle over the past two weeks and my sore pruning hand swelling had gone down. The prednisone had gotten control of the bug bites. I walked up to the mail box and picked up a few dead branches that had blown down onto the driveway but nothing serious. Then I went down to the dock to make a few exploratory casts and noticed right away that a fairly substantial water oak had been broken by the wind. Not uprooted but twisted, split, and broken and the area around the picnic table was a disaster. I got my tree kit including the hand pruner, loppers, and chain saw and within an hour, had it back in shape. I’ll have about that much more time invested by the time I haul it all over to the burn pile and convert it to ash. I have learned one thing from my neighbor. On one of our recent tree limbing outings, I picked up his pruner and loppers instead of my own. What a difference. His cut through the limbs like a hot knife through butter whereas mine require much more blood, sweat, and tears. He sharpens his and I don’t. Until then. I hit Harbor Freight, picked up a set of files and set about working on my tools. While I was at it I picked up an oil can and lubricated all the moving parts. Wow, what a difference. I don’t think mine are as sharp as his yet but I’m going to pick up a whetstone and really get to work on them. I think if I had been working with sharp tools the last couple of weeks, all those hand problems wouldn’t have happened. Seems like I would have learned that about 50 years ago, doesn’t it? Add Suwannee River sturgeon attacks to the Outer Banks shark attacks. In case you missed the news, the Suwannee is loaded with large sturgeon that just occasionally jump out of the water and have been know to collide with boaters. That’s the same place Simon did his kayak trek earlier this year and actually saw a few jumps. Tom was fishing there a few weeks ago and also reported flying sturgeon. These guys can get to a couple hundred pounds and 7’ long. In this case a child was killed and the mother and brother injured enough to require facial surgery. Officially ready for the next event at the lake. I spent the week clearing jungle (still/again). It only cost one round of prednisone because somewhere along the way I was bitten by something that overwhelmed my immune system. I don’t think it was the wasp hit but it could have been plain old mosquitoes, gnats, or fire ants. It might even have been some jungle plant, a distant cousin to poison ivy. For a day or two I thought maybe it was splash over from the jalapeños. We pickled another batch this week along with another, probably the last, batch of spaghetti sauce. We ended up with 10 jars, enough to last until next season if I ration them carefully. So I’m walking the edge as to growing a fall crop. Anyway, I’m dosed with prednisone and Benadryl and coated with anything that says itch relief on the label – mostly cortisone and calamine lotion. Anyway, the jungle is looking good and we can properly celebrate Olivia’s 19th birthday. Weather permitting. Getting a little rain but not enough to lift the lake level (yet) – just keeping up with evaporation. It also keeps the water cooler for great swimming. The fishing is just ok – not great but I usually pick up a fish or two. I go out almost any time the urge strikes – morning, mid day or evening – mostly decided based on wind and weather conditions. So if it rains mid aft and cools things off, I’ll pop out in the kayak for a half hour or so to give it a try; Not unusual to do that a couple times a day. Tough life, I know. With the garden going into a rest period, fishing is the replacement. Shark, gator, and bear attacks. What do they have in common. They’re all protected. There’s a reason people got rid of them 50 years ago. The shark one cracked me up when I heard it linked to global warming the other day. I think it might be better connected to the recovery of sea turtles – sharks showing up near the beaches as the baby turtles hatch and head to the sea. Each nesting season has become better for a few years now so…………. If I were running North Carolina I’d be authorizing a bounty on sharks caught in the surf as a reward to us diligent surf fishermen protecting our shorelines from finny invaders. Or running restaurant specials on shark fin soup. I keep wondering when Biden will jump into the race. I can’t guess yet which Republican Governor he’ll face but he should have a pretty clear run after Hillary self destructs and the old commie crashes. The jalapeño crop is peaking but not many takers this time around. Funny – some years I can’t grow enough to satisfy the demand; some years there are plenty of peppers but not many takers. So we decided to pickle a few jars this year. To calibrate you, about 3 pounds of peppers makes 6-7 16oz (1 cup) jars of finished product. The last time we did this I wasn’t very careful handling the peppers and paid the price with skin burns and watery eyes. This time I wore latex gloves and almost got thru unscathed. What I didn’t realize was that I did prick through the gloves in a couple of places and in a couple of hours my hands felt like they had been stuck in a fire. I tried soaking my hand in ice water which helped a little. Then I remembered the aloe plant and wondered whether that would work for chemical (pepper) burns. It does. Instant relief. We use aloe a couple times a year but that’s absolutely worth having it around. Haven’t reported on the progress of the pineapples in a while. The first 3 that I planted in a large container on the front deck are thriving-all new foliage and probably 3x the size a month ago. No signs of any fruit yet but I’m gaining confidence that the experiment will be a success. The 6 that I planted directly in the garden a few weeks back seem to be holding their own; no new growth, but no signs of dying either which, I think, means they’re doing ok. If they’re not going to make it, they seem to crash quickly. The other (hopefully) success story is that the viburnum bushes Simon and I had so severely trimmed are starting to put out buds. I’d take a picture but the buds are really too small, just little green spots on the trunks now. The buds are wide spread and each of the trunks is showing the signs. The garden is winding down rapidly now with the summer heat. Peppers and eggplant are about the only thing thriving. We’ll probably get enough tomatoes to make another one or two batches of sauce but the plants are looking worn out. A few straggler cuc’s and zucchini making a try of it but they’re on their last legs. Beans are done. In another couple of weeks I’ll start seeds (indoors) for the next round of peppers and tomatoes. The compost pile is welcoming all the new inputs from the garden.